You're reviewing: Microsoft Office 2010 Home and Business. Microsoft Office Home and Business 2010 is one of the three variants that come in with the 2010 Microsoft Office platform. This one, as the name says, Home and Business is simply the perfect tool to assist you in finishing business projects, keeping track of everyday budgets and even helping your children with their school tasks. However, its main strength would be mostly appreciated from small and medium sized businesses, which can take advantage of the features included in the package. 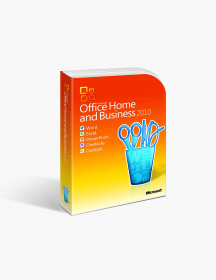 Operating your business, staying in touch with your clients or simply running your personal finances has never been so easy – Microsoft Office Home and Business 2010 is the perfect tool to help your work faster and more effective. What Are You Getting With This Package? Microsoft Word 2010 Regardless of the type of text document you wish to create, Word 2010 is the perfect solution for your needs. Its immense variety of templates, 3-D effects, shadows, SmartArt graphics and other text formatting options, allows the user to not only produce good looking documents, but also give the reader a feeling of involvement and completeness. Whether it is business report or friendly newsletter you are writing, it has never been so easy to design documents before. Microsoft Excel 2010 Excel 2010 is the ideal tool to track your personal expenses or create business budgets. It contains exciting new analysis tools such as Slicers and Sparklines which allow you to process and comprehend data more efficiently. Numerous different templates, colourful graphs and charts are just a few clicks away with this enhanced version of Excel. Microsoft PowerPoint 2010 PowerPoint have always been a household name when it comes down to creating beautiful stunning presentations. Whether you want to impress your customer with dynamic modern animations or just lay out the important information for them, you have a whole lot of visual effects and templates ready to bring life to your presentations. Microsoft OneNote 2010 OneNote 2010 is your perfect solution to keep your notes and information at a single place. It also provides powerful search functionality so you can easily find whatever you are looking for, as well as easy-to-use share notebooks so you can manage your data and share it with colleges and team members. Microsoft Outlook 2010 Outlook is already one of the best email services out on the market. Not only it allows you to sync multiple accounts, so you never miss a message, but some additional features such as Task list tool, Calendar and Group Scheduling can greatly help you manage your appointments and business tasks. Microsoft Office 2010 is an upgrade for businesses and individual users that is worth every penny. 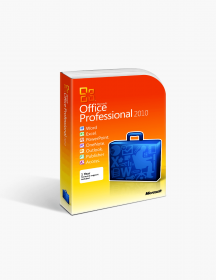 This Office suite takes the already established 2007 version and adds a great many tools to it, to enhance your workflow. 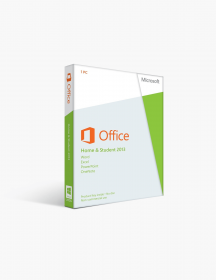 Whether you choose Office and Business, Home and Student or any of the Professional packages, Microsoft Office offers a professional-level of applications for data processing and storing and document creation. While it is true that upgrading to this newer version of Office might take some time, most of these new time-saving features are guaranteed to improve your work performance. Even new users will find the benefit of easily creating modern-looking documents and top-notch presentations and spreadsheets. Improved Ribbon system - One of the major changes that come with Office 2010 Home and Business is the improved Ribbon system. Previously introduced with Office 2007, this feature allows the user to manually add or remove options to the Ribbon, resulting in more effective and efficient utilization of the tools that come in with this suite. Exactly as in Office 2007, the Ribbon feature consists of always-on-tabs as well as contextual tabs that are only being shown when needed. For example, image formatting tools would only come up if you have selected an image. The Ribbon is integrated in every application that comes with Office 2010 and it can be modified according to the user’s preferences to better suit his needs. We can only suggest to people that are still not found of the Ribbon, that with time this cross-application functionality will prove to be useful and time-saving. Better document management - Another exciting change for Office 2010 Home and Business is the full-page document management section named Backstage. Much like its older version, Backstage allows the user to open, save, print and/or export his/her documents. However, there are a ton of added functionality that can greatly enhance this process. One can now set permissions to lock down changes, such as password-protected document encryption, that would restrict access for specific users. Backstage has also the option to digitally sign documents in order to ensure the integrity of files. Saving and sharing - Saving and sharing documents has never been easier. This new upgraded version of Backstage now ensures compatibility with older versions of Office and gives the option to inspect files for hidden data such as comments and reviews. Once the user has accurately inspected his/her document, the Save and Send button gives plenty of sharing options. Whether you need to attach the document to an e-mail, save it to a Web Dropbox or get it on SharePoint for interoffice availability, the Backstage window provides options that can greatly increase your efficiency and time management. Style Galleries - Finally, Office 2010 allows the user to swiftly change the overall design of his/her documents. The pull-down Style Galleries give the ability to choose fonts, colours and styles and create templates from them within a few clicks of the mouse. For example, in PowerPoint, one can simply hover over different animations and effects to see their effect instantaneously, without actually applying them. This neat function, integrated in all applications like Word and Outlook, allows users to see changes in real time, before committing to them. These are minimum system requirements for installing Microsoft Office 2010 Home and Business. CAD$129.00 | In Stock Want it Now? Order and receive your download instantly.